In the last few month I hit 200'000 views on my blog and reached 2'000 Facebook followers and I wanted to thank all of you with a fun Bento Starter Kit Giveaway! *cue the confetti* THANK YOU SO MUCH FOR SUPPORTING ME! 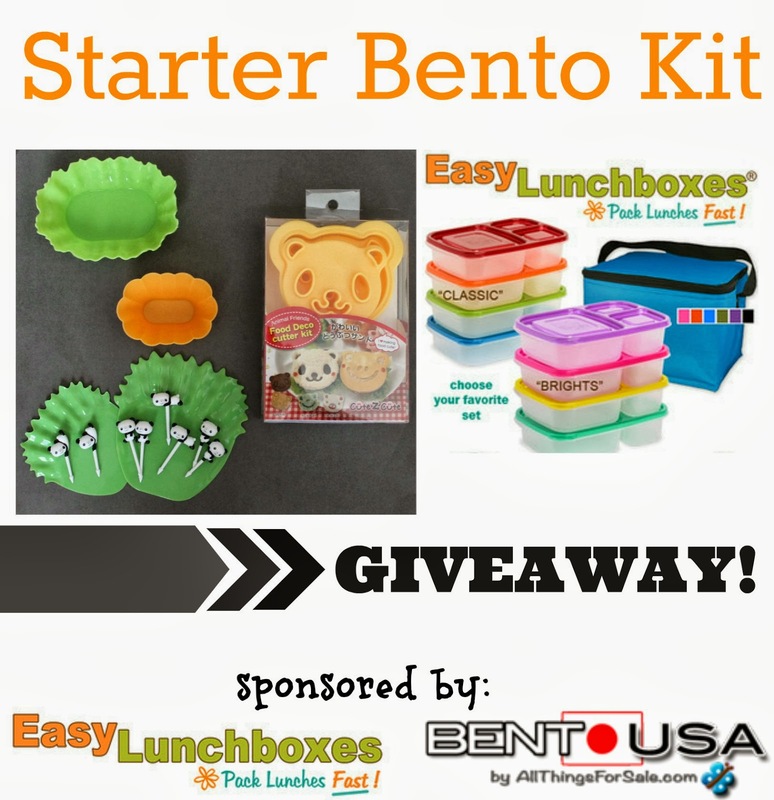 So I teamed up with my favorite brands and am bringing you this great Giveaway sponsored by Easylunchboxes and BentoUSA! I made this with all the new goodies you can win! I packed our Easylunchboxes with a CuteZCute Panda sandwich, a Z bar decorated with cute Panda Picks, a mini silicone cup filled with Naturebox Cranberry Bites, strawberries in between two silicone dividers and mini peppers also decorated with panda picks! 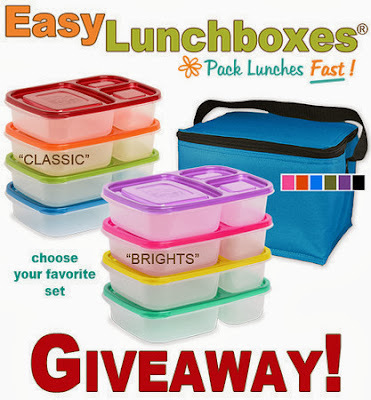 Kelly from Easylunchboxes is sponsoring a set of Easylunchboxes (color of your choice) AND a cooler bag (also color of your choice). If you are a regular reader of my blog you know that I LOVE Easylunchboxes! Plus they are the #1 best-selling lunchboxes on Amazon.com! They come in a set of four, are stackable, easy to open and simply perfect no matter if you pack a regular or bento lunch, lunch for the kids or you or simply want to pack take along meals for outings or car rides. You can get FREE SHIPPING if you order from Amazon.com or Amazon.ca as well! In addition, the three sections make it easy to pack a variety of foods and at the end of the day you simply put them in the dishwasher!! Wondering about the cooler bag? I recently reviewed the cooler and no matter if you are taking several ELBs with you or just packing lunch for one - these are great! They are roomy, washable (yes in the washing machine!) and ours so far have held up perfectly for two school years and counting! Well worth your money and with all the color choices available a must-have! BentoUSA generously is providing the winner with one CuteZCute Deco Cutter, cute Panda Picks and these great silicone cups and dividers! I love shopping at All Things For Sale and get most of my bento accessories there. They have $6 flat rate shipping, always new stock and the best prices around. They are a San Francisco based online store, specializing in Japanese lunch box goods, bento accessories and cute kitchen tools! All products sold by bentoUSA are BPA free and made of food safe materials! They really go the extra mile for their customers and shopping is always a fun experience! What are you waiting for? Come enter! Open to US and Canada Residents ONLY! I love the fact that you can easily fit snacks and lunches together in the same container. I love how easy they are to pack in plus they stack so nicely in the cabinet that they don't take up a lot of space. I love this type of container for lunch packing. I pack 5 lunches every night...so I can always use more. I have packed them with sandwiches, salads, yogurt, fruit, veggies, crackers, etc. I love packing them full with a variety of foods. I love that the compartments are divided like that and that they come in sets of four. I would make lunches ahead of time because of that. I love that they are stackable and that the lids are different colors. Easy Lunchboxes look nice even when not overflowing with food, which is somewhat unusual. I have not used this type of lunchbox yet, but would love to give it a try! It looks like it is a great size! I currently have just one school age child I use a Planetbox Rover for and my two younger girls have started wanting fun lunches like their brother, so these would be great to use for them!!! The lunch coolers come in a variety of awesome colors and the Mini Dippers and Sauce Containers are a must have. I love the compartments. They make bento much easier! I love how everything goes together. The mini dippers are super cute! I love how they have compartments & that they come in a pack of 4! I like that they have no BPA, PVC, or phthalates! I actually lived in Japan for a while and what I love most about the website is that it makes something so fundamentally Japanese and allows a wide audience and cultures to easily embrace and adopt the bento box! Great quality in sets of 4 in cool colors. Nice sized compartments to make it easier to use. I like that they nest for easy storage! I love how you can pack your entire lunch in one container while keeping the items separated. I also love how they are free of toxic chemicals. love that they make packing so easy! I love the color selection and that they are bpa free! I like all the colors and of course BPA free. I love that you can just stick them in the dishwasher - even on the bottom rack! I love that ELB stack inside each other for easy storage. I love the fun colors and that they are dishwasher safe! Inexpensive and easy to clean! I love the fun colours and their durability! I love how affordable they are. I love that Easylunchboxes are microwave and dishwasher safe! I also love the compartments! I love the fun colors and the fact that they're BPA free! I love the easy open tops! And the fact that the whole lunch is in one container instead of 3-4 small containers. Perfect for little fingers. I love how practical they are! They're easy to pack, easy to clean, easy to store, and also easy on your wallet. Perfect! I love the bright colors and easy clean up! I love that they are microwave, dishwasher and freezer safe! I love that the lunchboxes contain no BPA, Lead, Vinyl or PVC! I love how quick it is to pack a lunch with these lunch boxes! I love that they are BPA free and they have individual compartments! The boxes are adorable, and colorful. It'd be easy to clean, which is great for a super busy college student such as myself. Plus the compartments would make it easy to pack all the food groups :D! I love that they are easy to use, cute and safe! Love that they are dishwasher safe! The price is right, and they really make packing lunch quick and easy! I like the neatness aspect of it and the fact they are BPA free. I love the serving sizes within the container....and the cute colored lids! I love EasyLunchBoxes!! Use them for my twins when they go to preschool. They are durable and easy to wash! I love that they go through the dishwasher without warping. I love that the box keeps foods and snacks separate but without having to pack multiple containers! I love that easy lunchboxes are simple for kids to use, yet very sturdy. I would love to have these. So easy and cute. I love that they are easy for kids to use yet sturdy. I love that it comes with 4! I can get everyone's lunch ready at the same time! I love that I don't have to buy plastic baggies! The sections just make it really easy to pack a lunch! I love the color selection and that all four of my kids could have the same lunch coolers and boxes in their favorite colors. I like that the EasyLunchboxes are freezer & microwave safe. I love BPA free and the gorgeous colour selection! Love our easy lunch boxes! I can make homemade lunches quick and easy. People at my work have seen them and bought them for their kids as well! I love the little individual compartments, and that they are dishwasher safe! I love that it's leak proof and BPA free. I love the homemade lunchables! I love the color selection which would make separating and remembering which lunch belongs to who for my nephews and nieces easier. I love them because they have fwe compartment so my food don't mix. I love everything about my ELBs! The compartments, easy open / close. The colors! Mini Dippers are awesome too! Love the size of the containers!! They can hold it all. I love the simplicity of it all! I love the size and colors the boxes come in. I love that they're BPA free! The variety of foods is great. I love that its No BPA, Lead, Vinyl or PVC !!! I love everything about Easy Lunchboxes. We have a set and use them EVERY DAY for the kids' lunches! I love that they're easy to open, haven't leaked yet, hold up well to use and abuse, and the customer service is fabulous! I love that my kids can open them easily! I love how easy they are to pack and to clean and also that they're very affordable. ELB's are great for kids and adults. We use ours all the time. They are very affordable that is what I love about them!! We bought our first set this school year and love it! I love how easy they are to pack and to clean. I need another set. One container to wash and nothing touches! Makes it look "fancy" too. No leaks yet easy to open is awesome! And I love the separate compartments. I love the easy to get off lids and all of the fun colors. I love that easy lunch boxes make packing lunch fun for me! 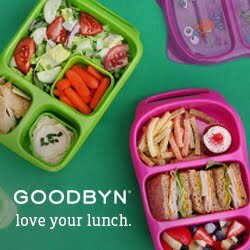 Love that they are eco friendly and have compartments so I can pack a variety of healthy foods without having to use sandwich bags or a bunch of different containers. I love the compartments and the colors. Done!!! I hope I win!!!! I love the price and how easy they are to store! I like them for portion control, convenience (stackable), and for how inexpensive they are (cheaper than buying food every day)! i love how they are all spaced out to separate food. Love that there are only 2 pieces to keep track of! I pack bentos for my hubby so an adult sized container is GREAT! Normally i have to pack him 2 lunchboxes but these look fab! These would be perfect for my husband and my lunches! I really hope I win! They have lots of room for variety! I love that the sections are separate, so you can pack an interesting lunchbox for school lunches without having lots of containers, it's all in one! Oh and I love the colours too, the whole family can use them. Easylunchboxes are the best because they are super simple and allow you to be creative while keeping everything contained. I love that they are so compact and organized!! The best lunch system HANDS DOWN! My almost-five-year-old love them just as much as I do. He likes everything 'just so' and I can easily do that with the separate compartments. I can always add a little dipper of a cupcake liner, too. Every morning he wants to *see* his lunch! His teacher told me a little while back just how much fun it is to watch him at lunch. He can get the lid off all by himself and he puts everything back together, just so. I'll probably be using these ELB for both boys until the cows come home!